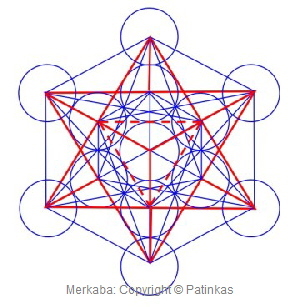 The word Merkaba can be broken down thus: MER: rotating fields of light, KA: spirit, and BA: soul (this is taken from an 18th dynasty Egyptian translation, and in Hebrew it means 'chariot'). Therefore, Mer-Ka-Ba means the spirit or energy body surrounded by counter-rotating fields of light, or spirals of energy (as with a strand of DNA), which transport spirit or consciousness from one dimension to another. The MekaBa is the Light Body vehicle, and it is the key to understanding how to move from one dimension or level to another. It is the divine light vehicle supposedly used by Ascended Masters to connect with, and reach those in tune with the higher realms. When this shape is activated around your body, you are in a place of complete protection, with the surrounding energy being generated from pure Divine Love. 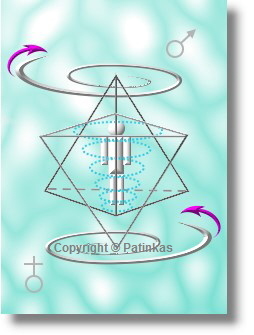 It is believed that with practice, using the energy and shape visualization of a Merkaba, you can activate an energy field around you which is capable of carrying your consciousness directly to higher realms. 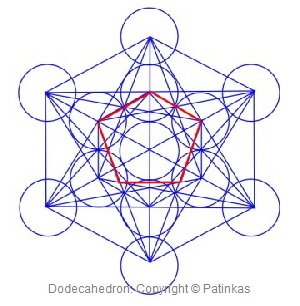 When meditating, try sitting holding a MerKaBa and picture yourself inside this shape, with the two tetrahedrons rotating (as described above). It takes some practice, but is eased greatly by actually having a Merkaba to focus on! When achieved you will be sitting in a place of complete protection, harmony and Universal balance. Platonic Solids are shapes which form part of Sacred Geometry. They were first catalogued by the ancient philosopher, Plato (hence their name), although evidence of these most magical of shapes has been found around the world for in excess of 1,000 years prior to Plato's documentation. They are made up of the 'Five Convex Regular Polyhedra': hexahedron (cube), octahedron (double inverted pyramid), tetrahedron (pyramid), Icosohedron and dodecahedron. The names are derived from the number of sides each shape has: 4, 6, 8, 12, and 20 respectively. The first four shapes correspond with the elements: earth (hexahedron), air (octahedron), fire (tetrahedron) and water (Icosohedron), with the fifth, dodecahedron, representing heaven, ether or the Universe. 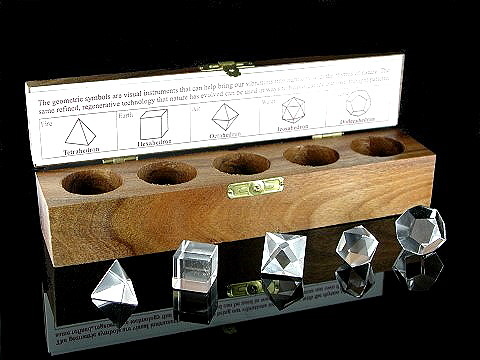 The shapes that form the five original Platonic Solids occur naturally in nature, and indeed in the crystal world. Working with them individually is said to help with our connection to nature and the higher realms of the cosmos; to find the common pattern which links us all at a molecular as well as at a spiritual level. The Flower of Life is a geometrical figure composed of evenly spaced, overlapping circles, arranged so that they form a flower-like pattern. Each circle has a six-fold symmetry like a hexagon, i.e. the middle of each circle is intersected by six other circles of the same size or diametre. The oldest example of this shape found so far is in The Temple of Osiris in Egypt. Other examples can be found in Phoenician, Assyrian, Middle Eastern, and European medieval art. The design of the Flower of Life contains the basis of Metatron's Cube, and the five forms we know as the Platonic Solids are derived from this shape. 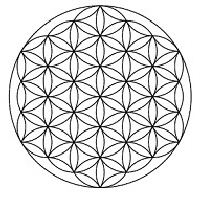 The Fruit of Life is a shape taken directly from the Flower of Life (see below). It is made of thirteen equal sized circles. If you connect the centre of each circle to the others with a straight line, you end up with 78 lines in total. The final shape forms what we refer to as Metatron’s Cube. Within this shape or cube, many other shapes can be found, including two dimensional versions of the five Platonic Solids. Metatron's Cube is, therefore, the template that delineates the Platonic solids. 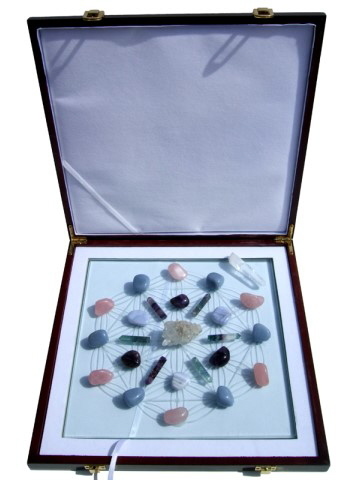 These solids are the five structures that form the building blocks of organic life, and which can be found in crystals minerals, organic life forms, sound, music, language and so on. 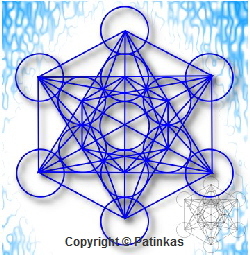 In early Kabbalistic scriptures, Metatron supposedly formed the cube from his soul, and Metatron is also a reference to the highest Kabbalistic angel who sits at Kether, or the God Head. 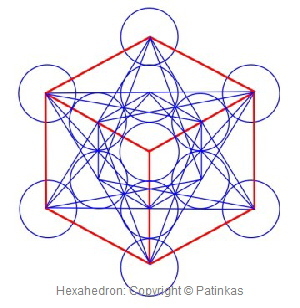 Metatron's cube is also considered a holy glyph, and was often drawn around a person to ward off evil spirits and dark entities. It is present in many of the ancient mysteries including Egyptian mythology, ancient Judaic teachings and in alchemy. It is a primordial and very powerful image.